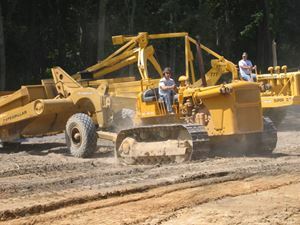 Please share your images of the 2008 International Convention and Old Equipment Exposition which was held August 8-10 at the National Pike Steam, Gas & Horse Association at their showgrounds near Brownsville, Pennsylvania. Tom Kelly owns this wonderful 1926 Keystone No. 4 skimmer. 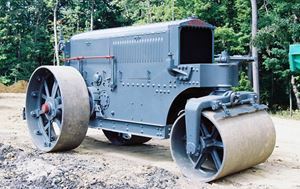 Specifics are unknown about this Buffalo-Springfield three-wheel roller owned by Dave and Mary Anne Lytle, but we believe it’s an 8 ton machine built circa 1936. Action in the sandbox! 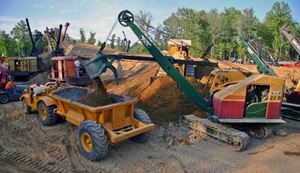 Don Martin’s 1946 Cat DW10 tractor/W10 bottom dump wagon receives a load from Don Stewart’s 1950 Bucyrus-Erie 22B as one of the four D8s as site shoves dirt within reach. Jay Anders’ 1959 Schield Bantam C350 shovel waits to go to work. 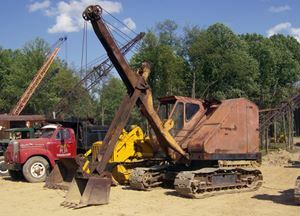 This 1945 Lima 34 shovel is owned by the firm of Kelly, Ackman, McElhaney & Marburger. 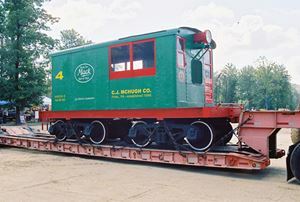 This is one of two 1924 General Electric trolley freight motors that Mack Truck, Inc. bought in 1939 and rebuilt into experimental gas-electrics for sale as new products. 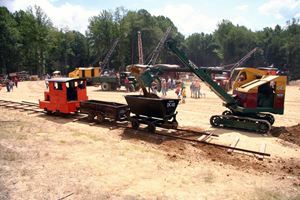 This is the first working railroad at an HCEA show: A narrow-gauge Brookville locomotive and dump cars (being loaded by Jim Gangle’s 1950 Bucyrus-Erie 10B shovel) owned by Ohio Vintage Coal Company. 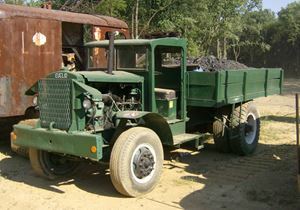 Out of the three Euclid trucks on site, the Kelly Family’s 1936 2KD stake truck was the most unusual. 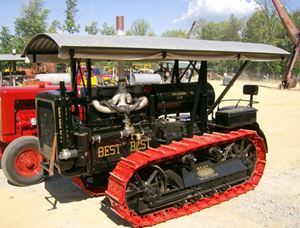 Howard Bowers showed several beautifully restored tractors, including this 1925 Best 30. 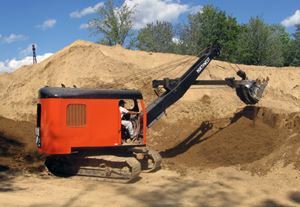 James Powell’s 1955 25, one of ten Northwests on site, works on cutting the dirt pile down to size. Presenting the largest wheel loader and, possibly, the largest mobile machine of any kind at an HCEA event: Wayne Baker’s Cat 992. The Kelly Family’s 1913 Thew Type No. 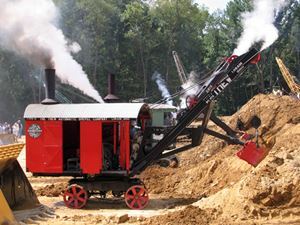 0 is the only operational Thew steam shovel in existence. Instead of only describing an arc from a pivot point in the boom, the dipper stick also racks forward. Action in the “sandbox” was concentrated and intense. 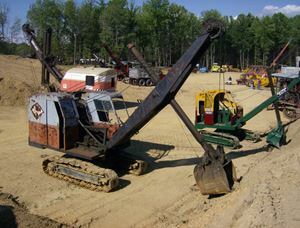 Over a dozen cable excavators are visible in this photo of one corner of the action! 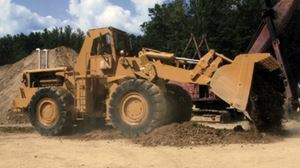 The Volvo loader was provided for support by Volvo Rents. Show chairs Lou and Erma McMaster had a number of pieces at the show, including this 1959 Cat D6 and 1951 Cat 60 scraper. 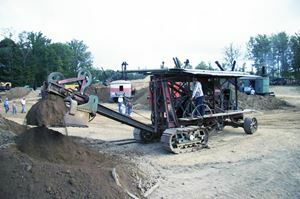 Dale McManamon’s Super C Tournapull and LP Carryall work the pit with them. 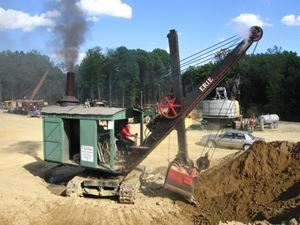 The famous 1927 Erie Type B steam shovel that the late Rusty McGinness donated to the National Pike Steam, Gas & Horse Association was one of the hits of the show.